He has some serious skills! We're used to our favorite YouTube beauty vloggers demonstrating their killer makeup skills in fun tutorials, but it's not every day that you see a male news anchor showing off his blending talent. But that's exactly what Cincinnati-based news anchor Bob Herzog did in a funny video he posted on Facebook late last month. 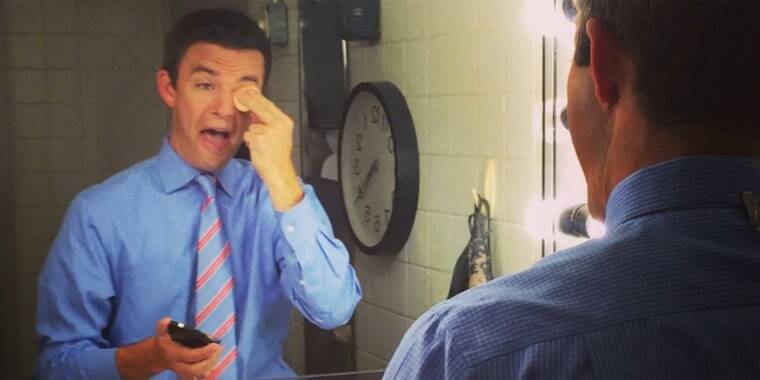 The 43-year-old anchors "Good Morning Cincinnati" and has been posting "Wake up and makeup!" videos on his Facebook page since last year. The video series began as an upbeat way to help people start the day, Herzog told TODAY Style, but this was the first time he's actually filmed himself applying makeup. "This was just a way to try to make folks smile. I started it at the beginning of the year and didn't even do my makeup in the videos until last week — it was just me jabbering. Now I jabber, and contour," he said. The morning news anchor clearly has a great sense of humor, and he takes fans through his makeup process in the video, showing off some impressive blending skills. Herzog starts off with a generous dose of concealer, commenting, "This, as I understand it, is called concealer. It is for concealing things, like the ridiculous circles under my eyes. I can't fill in the divots in my forehead; they are far too deep." While blending in foundation, bronzer and powder, Herzog walks fans through the application process with his signature humor. "I blend like I'm angry at my skin. I'm a violent blender," he jokes. As co-workers watch in the background, Herzog gets some funny feedback on his blending technique, with one woman calling it "aggressive." Another eggs him on from the sidelines, saying, "You're gonna be the next YouTube star!" One of our favorite parts of the video? When the anchorman makes the trademark awkward "makeup face" we all do while applying our favorite products. The morning news anchor told us his time in the makeup chair has made him realize just how much work goes into the beautifying process. "Not only has my respect gone up for those who actually know how to do their makeup, but I'm floored by the vastness of makeup nation," he said. "Everyone is so nice, telling me, 'Don't blend so violently; you'll get wrinkles.' Or, 'That's a lot of primer, Bob!' Everyone is trying to help me, this poor, lost soul," he joked. This isn't the first time one of Herzog's videos have gone viral. In 2012, he caught attention for his epic on-air dance moves while doing a traffic report. It looks like fun and games are all in a day's work for this amusing anchorman!